Start off from the roundabout at the entrance to the city with a magnificent sculpture of a horse. At this roundabout, take the 3rd exit towards Avenida de Palma de Mallorca. Continue straight along this road for some 600 km. On the way you’ll pass straight through a roundabout, continuing along the same road until you reach a large roundabout. At this roundabout, take the 1st exit into the RC-2. Continue along the main road for approximately 1.6 km, going straight through two roundabouts, until you reach another large roundabout where the road joins the Me-24. At this roundabout, take the 3rd exit into the Me-24. Follow the Me-24 for approximately 700 m until you see a roundabout. At this roundabout, continue straight on down the Ciutadella to Cap d’Artrutx road/ Me-24 until you see a new roundabout. At this roundabout, take the 2nd exit towards Calle de Artrutx and continue for approximately 350 m.
Turn right into Calle de la Playa. Continue along this road until you see a parking site on your left, next to the beach, where you can park. Cala Santandria cove is characterised by its modest size (only 110m long by 25m wide), its popularity with both local bathers and tourists, a sand bank, light breezes, peaceful clear water, and slight slope. When it’s time to return to Cap d’Artrutx, go south-east along Calle de la Playa towards Calle de Falciot. Continue along Calle de Rupit for approximately 160 m until you see Calle de Sabellarol on your left. Turn left into Calle de Sabellarol and continue for approximately 260 m until you get back onto the Ciutadella to Cap d’Artrutx road/ Me-24. Giving way to vehicles on the main road, turn right into the Me-24 and continue straight on until you see a roundabout. At the roundabout, take the 2nd exit towards Calle de Artrutx and continue for approximately 6.3 km. On the way you pass 2 roundabouts, always making for Cap d’Artrutx. Around 500 m from the second roundabout you arrive at your destination. 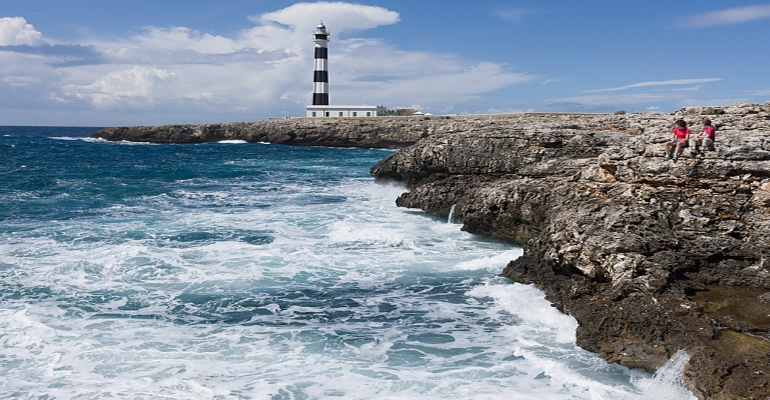 The Cap d’Artrutx lighthouse, built in the mid nineteenth century, does not have the charm of lighthouses like Favàritx, Cavalleria or Punta Nati, but its characteristic black and white stripes have inspired many paintings. On a good day, from the cliffs to the left of the lighthouse you can see the island of Mallorca. These days the lighthouse has a fine restaurant where you can sample signature dishes that reveal the secrets of Menorcan and Mediterranean cuisine. Finally, to get to the heart of the Cala en Bosc development you only need to turn north east onto the Cap d’Artrutx road and continue until you reach a roundabout. At the roundabout, take the 1st exit on the right into Carrer Llevant Cap d’Artrutx. Continue along Carrer de Llevant until you reach the Vía Circunvalación. Park your vehicle at any of the many parking sites along the main road and enjoy the services that this lively development offers: restaurants, pubs, leisure centres, shopping centres, souvenir shops, etc. Cala en Bosc, located between Marina de Cala en Bosc and Punta de sa Guarda and near the Cap d’Artrutx and Son Xoriguer developments, has a beach (80 m long by the same wide) that is very popular in summer, and a marina with a choice of several excursions by boat along the coves in the Ciutadella area. * Ownerscars has an office on Vía Circunvalación, junction with Punta Nati, shop 1.